The Navy has sent a three sailor explosive ordnance disposal detachment to Boston to assist with the aftermath following two Monday explosions during the Boston Marathon, a Navy official told USNI News Tuesday. 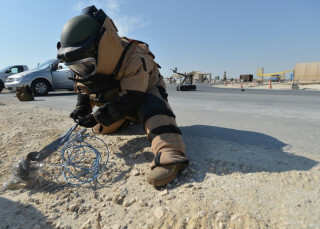 The sailors, based at Naval Station Newport, R.I., are part of Explosive Ordnance Disposal Mobile Unit 12 (EODMU Twelve), the official said. The unit was sent under the auspices of a mutual aid agreement with the Massachusetts at the commonwealth’s request. “The detachment provides services to all DoD installations in the New England area and eastern N.Y. state. It frequently provides assistance to federal, state and local law enforcement agencies to include United States Secret Service and the Dept. of State for VIP protection,” according to the unit’s website. EODMU Twelve’s headquarters is located at Joint Expeditionary Base Little Creek-Fort Story, Va. So far the unit, aside from the National Guard, is the only asset from the Pentagon sent to the scene in Boston, according to press reports. The morning after the explosion, little is known about the explosive devices that detonated shortly before 3:00 p.m. EST near the finish line of the more than hundred year-old race – the world’s oldest annual marathon. A former U.S. counterterrorism official contacted by USNI News said his first impression of the incident bares similarity to terrorism acts in the North Caucasus region of Russia. “My immediate thoughts were that the bombs were likely small, crude homemade devices consisting of maybe 500 grams (or more) of explosives (perhaps aluminum powder and ammonium nitrate) with ball bearings or shredded armature wire for shrapnel and detonated by a cell phone,” said Paul J. Murphy, author of Allah’s Angels: Chechen Women in War, in an email response to USNI News.